Tuscany Cove Homes: WOW. Jaw-dropping, stunning and ready for plenty of fun and memories to be had with family & friends... this Tuscany Cove home was made for YOU! Take a look: totally remodeled with a contemporary style from head to toe in the last 2 years, this 3 bed PLUS den / 2 bath beauty features designer touches throughout, gorgeous tile/laminate floors, stainless steel appliances & sink, granite countertops, amazing spa-like jacuzzi tub in the master bath, a den for spending time on your favorite hobbies or work and your own POOL for fun in the sun! Spacious floorplan with plenty of room to stretch out. Dues are LOW in the gated comunity of Tuscany Cove but the amenities are many, including basketball, cable/internet, fitness center and water-splash playground. Did you see this location? All of your shopping & dining conveniences are around the corner and the new Logan's Landing shopping center with SPROUTS is a stones' throw away! And just a quick drive to your other Naples favorites like the incredible beaches, Mercato & more. You CAN have it all and this home is a can't miss! Tuscany Cove Homes: This beautiful 3 bedroom plus den, 2 bathroom home with 2 car garage is located in the gated community of Tuscany Cove. This home features a beautiful lake view from the private pool, roman soaking tub, walk in shower, paver driveway, tile roof, high-impact glass, and diagonal tile. Home has been freshly painted, some new appliances, and laminate hardwood flooring. Tuscany Cove's 7,000 sq. ft clubhouse offers many attractions including a resort style pool and Spa, fitness center, aerobics room, billiards room, media center, and tennis & basketball courts. Just minutes away from shopping, dining, and Naples famous award winning beaches. Tuscany Cove Homes: Absolutely wonderful 3 Bedroom plus Den 2 Bath home with extended Lanai! Incredible view with Southern Exposure facing the Lake. Impeccably clean with separate living spaces for all! Separate Dining Room, Breakfast room, Great Room, Den, and 3 large bedrooms complete this home with a 2 car side load garage! This is truly one not to be missed! Tuscany Cove Homes: This fresh neutral palette is ready for personal & decorative touches. Pretty NE views from the generous family room, eat in kitchen & master suite, plus an extended lanai all overlooking the lush tropical preserve. Large single family home featuring 3 full bedrooms & a decent size den (12' x 11') with pocket doors, formal dining & situated in the back of the community, eliminating any highway noise. A couple of conveniences include the manual shutters & a central vacuum. Fabulous gated community with "A" rated schools & an abundance of new shopping very close by! Tuscany Cove a private gated community that boasts outstanding amenities; friendly clubhouse, billiards, media center, a large resort style pool with spa, kiddie pool with splash fountain, two exercise rooms, tennis & basketball courts. Tuscany Cove Homes: This beautiful 3 Bedroom, 2 bath pool home is perfectly located and has been exquisitely kept, move-in ready! The tile floors lead you through the home, dinning, and kitchen. The entertaining space is extraordinary with Living and Dining areas, with the beautiful kitchen, which is complete with full appliances set. Master bathroom boasts soaker tub and large shower, plus dual sinks! The lanai will be your escape, a beautiful place to relax or entertain with a covered area, pool, a Backyard hedge allows you privacy. The home could not be better positioned for you to enjoy the resort-style amenities available at Tuscany cove clubhouse. Tuscany Cove Homes: Major Price Reduction! Motivated Seller. Newly redone home throughout. Light, bright interiors, all new paint, all new tile throughout, all new appliances. Large and spacious, three bedroom plus den, formal dining room plus large eat in kitchen area that overlooks the lanai and water view. Spacious lanai with view of the lake. Volume ceilings that give the house a very open feel. The development has many amenities such as tennis courts, playground area, Olympic-sized adult pool/spa ,kids' pool with splash fountain, exercise room, billiards, media center and basketball courts. This won't last long. Call for viewing. Tuscany Cove Homes: Welcome to your beautiful single family POOL home located in Tuscany Cove of Naples. This IMMACULATE home offers 3 bedrooms, an open great room, and 2 full baths complete with an attached 2 car garage. **PLEASE SEE FLOORPLAN LINK** Natural sunlight flows throughout this home that boasts many upgrades, including IMPACT-RESISTANT DOORS and WINDOWS, TILE and WOOD FLOORING, NEW A/C system, GRANITE KITCHEN COUNTERS, and FRESH PAINT INSIDE AND OUT. Relax poolside on the private lanai providing gracious covered space, an OUTDOOR SHOWER, and shutters for additional storm protection. At days’ end, unwind in your luxurious master suite with hardwood floors, tray ceiling detail, and an ensuite bath featuring a large walk-in closet, step-in shower, soaking tub, dual sinks and linen closet. Tuscany Cove is a gated community located in North Naples with GREAT AMENITIES and low fees! Located in sought after Naples school district and just minutes from the sugar sand beaches of Naples with quick access to I-75…paradise awaits you! Tuscany Cove Homes: ***NEW PHOTOS***This 3 bedroom, 2 bathroom attached villa lives like a single family home and is located in the desirable gated community of Tuscany Cove. Ample room and parking with your brick paver drive, and two car attached garage. Enjoy ceramic tile flooring in the main and wet areas, and carpet in the bedrooms. Kitchen is appointed with stainless steel appliances, and an eat-in kitchen. Volume ceilings in the main living areas make the home feel large. Screened-in lanai is over-sized, and has a preserve view. Master bedroom is generously sized, has dual sinks and both a soaking tub and walk-in shower. Community has a beautiful 7,000 square foot clubhouse with a fully equipped fitness room, aerobics room, card room, billiards room, media room, social room and even a children's room. Outdoors, you will find an Olympic sized pool & spa, basketball court and two lighted tennis courts. Children will enjoy a play ground, a kiddie pool with splash fountain and a children's gazebo. The association fees include access to all of the amenities, basic cable and total lawn care that includes mowing, fertilization, insecticide, and irrigation. Tuscany Cove Homes: This home will truly not disappoint! Immaculate home lovingly maintained inside and out - Home sits on an oversized lot with with a huge side yard with privacy galore and an amazing preserve view! Gorgeous lighting, custom closets, impact windows, accordion hurricane shutters on lanai, engineered wood floors, new doors and hardware, brand new top of the line stainless appliances including washer and dryer - solid stone counter tops, new paint inside and out, custom built-in desk, custom closets, security system with TV. This home is as clean as a whistle and shows like a model. Tuscany Cove Homes: Don't miss out on this gorgeous 3 bed, 2 bath Juniper model in Tuscany Cove! The kitchen and baths are tiled and the living areas and bedrooms have newer carpet. The kitchen boasts stainless appliances and a newer LG washer and dryer set can be found in the laundry room. The expansive, oversized lanai faces south and the owner says there is room for a pool. The entire home was painted inside and out less than 2yrs ago and the A/C is less than 3yrs old! Schedule your private showing through ShowingTime today! Tuscany Cove Homes: Beautiful remodeled kitchen with granite, subway tile and stainless steel appliances. This home has undergone a transformation featuring new carpet in the bedrooms, new ceiling fans and the interior has been fully repainted. The back lanai has all new screens and the A/C unit was just replaced with a brand new 16 SEER unit. The home offers a spacious floor plan with 3 bedrooms each with pocket doors, 2 full bathrooms and a 2+ car garage. The home also features high vaulted ceilings, walk-in closets and dual sinks in the master bath. This home is a must see!!! Enjoy a quite evening while sitting out in your lanai with a tranquil view of the preserve. This community includes a resort style pool & spa with a beautiful clubhouse, fully equipped fitness rooms, billiards room, media room with big screen TV, card room, social room, children's pool with a splash fountain, screened gazebo, basketball court, and two lighted tennis courts. Tuscany Cove Homes: WOW! This is one of the "Best Deals" in Naples right now...just bring your toothbrush and enjoy! Impressive SOUTH-FACING Lot with a LAKE View and a private POOL. Absolutely, impeccably maintained attached villa with vaulted ceilings, 2-car garage on a quiet cul-a-sac street. This home comes Turnkey Furnished with a relaxing Coastal Feel. Beautifully maintained, TUSCANY COVE is a Gated Community that offers Terrific Amenities: Lakefront Heated Resort Pool, 7,000 SF Clubhouse with Media Room, Social Room & Billiards, Tennis, Pickleball, Basketball & Fitness Center! Easy living with lawn maintenance/irrigation, exterior pest control and basic cable included for just $960 per quarter. All this in a great location ideal for enjoying the Florida Lifestyle with easy access to everyday conveniences including shopping, dining, and I-75. Visit virtual tour link for additional photos. Tuscany Cove Homes: Beautiful community with a Mediterranean style. The home has been completely repainted throughout and is ready for immediate move in. The den could easily be used as a third bedroom if so desired. Tile flooring throughout so it is easy to maintain. This is a gated community located in some of the best A rated school systems in Collier County. The spacious 7,000 sq ft clubhouse has a completely equipped fitness center, aerobics room, billiards room with big screen TV, card room, social room and children's play room. The club house has an Olympic sized pool with spa, outdoor playground, kiddie splash pool, tennis courts, basketball courts, complete lawn care, exterior pest control and lawn irrigation. Very low quarterly fees for all these amenities. Just a short drive to the beaches and downtown Naples. Call for appointment to view as this one won't last long. Tuscany Cove Homes: BEST PRICED 3/2 POOL HOME! Great private location at the end of the lake. Large nature preserve in front across street. Professionally painted throughout with a beautiful neutral and light custom color. Tile throughout main living area. Quality engineered wood floors in all bedrooms. Impact windows and manual shutters for lanai. Central vac system. Refrigerator and washer recently purchased. New ceiling fans in living room and kitchen. Price and location can not be beat .. better hurry! Tuscany Cove Homes: QUALITY, COMFORT, AND CLASS! Pristine, light & bright 3 bedroom/2 bath/ 2 car garage single family home in the gated community of Tuscany Cove. This meticulously kept SPACIOUS floor plan with plenty of desirable features including large neutral tile in living areas, carpet in bedrooms, high ceilings, split bedrooms, stainless steel appliances, solid surface countertops, breakfast bar & pantry. Plus do not miss all of the stunning arches throughout the entire home. Upgrades include complete house painted, stainless steel appliances, new washer & Dryer, new water heater, and new carpet in 2nd bedroom! The large master suite boasts generous walk in closets, adjoining master bath w/dual sinks and shower. Step outside to the outdoor lanai where you can relax and entertain family and friends. Tuscany Cove is an active community with a Mediterranean style design. Amenities include a 7,000 SF clubhouse, beautiful community pool, spa overlooking the lake, youth pool, a splash fountain, children's play area, gazebo, fitness center, tennis, basketball, billiards, & more. Shopping, restaurants, schools & hospital are within a few minutes drive. Call today to view this fabulous home! Tuscany Cove Homes: LOWEST PRICED PROPERTY IN TUSCANY COVE! OUTSTANDING COURT LOCATION ON A CUL DE SAC! TURN KEY AND BEAUTIFUL MOVE IN CONDITION (TENANT IN PLACE TIL 3/30/19. OPTION TO KEEP TENANT IF WANTED AS AN INVESTMENT PROPERTY). PROFESSIONALLY PAINTED 2013. BRICK PAVERED DRIVEWAY AND WALKWAY. TILED ROOF. CERAMIC TILE THROUGHOUT MAIN LIVING AREA. GRET SCHOOL ZONE (A RATED). OUTSTANDING COMMUNITY WITH WELL APPOINTED AMENITIES THAT INCLUDE A RESORT LIKE POOL, EXQUISTITE CLUBHOUSE WITH 2 FITNESS ROOMS, SHOWERS, RECREATION ROOM, BILLIARDS ROOM AND FULL KITCHEN. KIDDIE POOL. BASKETBALL & TENNIS COURTS. ONE OF THE LOWEST HOA FEE'S WITH ONSITE PROFESSIONAL MANAGEMENT, AND SECURITY PATROLLED. TAKE ADVANTAGE NOW WHILE PRICES ARE STILL LOW! GREAT LOCATION ACROSS FROM PUBLIX AND PEBBLEBROOK PLAZA. Tuscany Cove Homes: This 3 bedroom/2 bath Attached Villa home is perfectly located in the North Naples. Located close to Naples famous beaches, NCH Healthcare Emergency room, Restaurants, Starbucks Coffee, and a Publix shopping center. A short drive to I-75, Downtown Naples, RSW Airport, Waterside Shops, and Miromar Outlets. 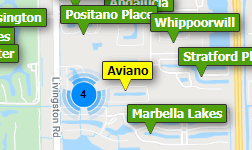 To top it off, Tuscany Cove is in Naples most sought after school zone with A rated schools! As for UPGRADES, this home offers Hurricane Windows, FPL surge protector for whole house, Water Heater replaced 2016, all the lanai screens were replaced 2 years ago, A/C and Washer/Dryer are 3 years old, and A/C is serviced annually! Tuscany Cove offers 7,000 sq ft clubhouse, social room, media center, fitness center, resort style pool, children's pool section, and playground. Schedule your showing today to see first hand everything this home has to offer and make this house your home today! Tuscany Cove Homes: This property is a beautiful, bright and cheery villa home that includes a kitchen, breakfast nook, eating counter, dining room, living room, laundry room, three bedrooms, two full baths and a double sized lanai that is partially covered . The double sized lanai can accommodate a pool for anyone interested. There is an attached two car garage with additional space for four more cars in an extra long driveway. This comes in handy when you have guests, since only off-street parking is allowed overnight. The property is quietly located towards the end of the only cul-de-sac in this gated community. Because this property is located in a top rated school district it is in high demand. The beaches, many golf courses and shopping surround this community. Tuscany Cove Homes: BUYER DEFAULTED! THEIR LOSS IS YOUR GAIN! !Owners have particialy relocated, ready to make a deal!! Lowest priced villa in the community. Immaculate 3 bedroom 2 bath 1 story villa with a 2 car attached garage. Located in one on Naples fast and rapid growing areas, near shopping centers restaurants and much more. This one of a kind villa offer many upgrades such as granite counter tops in the kitchen, brand new stainless steel Maytag kitchen appliances, wine cooler, brand new Whirlpool washer and dryer to mention a few. With its unique location within the community this villa offers tremendous tranquility and privacy. Also included is a State of the art surge protector which conveys with the property. A Power Quality and conditioning system that comes with a lifetime warranty, guarantees energy savings, surge and lightning strike protection. It also comes with a $100,000 insurance policy if the system fails to protect equipment and devices. Need professional assistance selling your property at Tuscany Cove Naples? Find out how an Area Specialist can help to generate more property exposure in order to get the most money for your investment in the least amount of time.